A roundup article on post-Christmas shopping on the front-page of the Business Day section of today's New York Times, The Day After Christmas, Shoppers Take a Holiday, doesn't otherwise mention Brooklyn, but the photo depicts a man with four shopping bags. The caption: "Keino Bennet leaving the Atlantic Center Mall in Brooklyn yesterday." 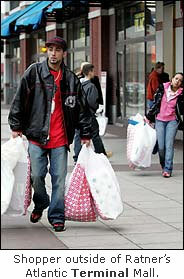 Also, the man pictured is carrying at least two bags from Target, an anchor tenant of the Atlantic Terminal mall. Both malls are products of developer Forest City Ratner, but Atlantic Center (opened 1996) is much-reviled for disrespecting the urban fabric, while Atlantic Terminal (opened 2004) gets more mixed reviews. As noted in Chapter 14 of my report, FCR head Bruce Ratner himself has criticized in Atlantic Center, telling the Times (Rethinking Atlantic Center With the Customer in Mind, 5/26/04): "Honestly, it isn’t beautiful. It’s not architecturally outstanding. It’s kept clean, and we do try and take care of it. It’s not as bad as a strip center in the burbs, I mean, but it’s not something that we would build again." Others are harsher. Observed architectural historian and critic Francis Morrone in The New York Sun (ABROAD IN NEW YORK, 2/23/04): Atlantic Center Mall is the ugliest building in Brooklyn. As for Atlantic Terminal mall, as noted in Chapter 10 of my report, a 5/22/05 Times Real Estate section article headlined The Underground Economy: Subway Retailing stated: The M.T.A. also worked with a private developer to turn Atlantic Terminal in Brooklyn into an attractive mall with almost 400,000 square feet of retail space. Now, Atlantic Terminal could not have been "turn[ed]... into an attractive mall" since it was built on empty land made vacant years ago after the historic Long Island Rail Road terminal was demolished. Atlantic Terminal more resembles the Manhattan Mall at Sixth Avenue and 33rd Street, which sits aboveground, with a subway concourse below. And The mall’s attractiveness is a matter of opinion. In a 4/25/05 New Yorker article, Rebecca Mead wrote (Mr. Brooklyn: Marty Markowitz—the man, the plan, the arena): The mall is an unlovely green-and-brown hulk bordering streets of brownstones, the shape of whose sloped roofs its own much taller roof grotesquely mimics. The esthetic distinction between the two malls matters on another level as well, because the Atlantic Center mall may be torn down to build a new and higher-yielding development. It's not part of the Atlantic Yards plan, but it needs to be taken into consideration by urban planners. At the same time in February that city and state officials signed a Memorandum of Understanding (MOU) regarding Atlantic Yards, they also signed an undisclosed MOU regarding two parcels of land. One parcel is Site 5 (now occupied by Modell's and P.C. Richard), to be replaced by a 430-foot tower as part of the Atlantic Yards project. The other is the Atlantic Center mall, which according to that second MOU--unveiled by Develop Don't Destroy Brooklyn in August--offers 1.586 million zoning square feet for a mixed-use development consisting of residential development, commercial office space, and retail space. According to page 3 of the MOU, if the arena project does not occur, Forest City Ratner would develop up to "875,000 square feet of commercial office space and up to 711,000 square feet of residential space on the Atlantic Center site." If Atlantic Yards does go through, the developer would subtract "328,272 zoning square feet of office, retail, and/or residential space." That would mean 1.26 million square feet. Given that Atlantic Yards, currently slated to be 9.1 million square feet, has been criticized as too big by even supporters like Marty Markowitz, the proposed project at Atlantic Center should be factored into the public discussion. In March 2005, ESDC, the City and FCRC announced the Memorandum of Understanding dated February 18, 2005 governing this project and entitled “Brooklyn Arena/Mixed Use Development Project”. There was another Memorandum of Understanding dated that same day entitled “ATURA Development Project” which was not announced. That second MOU appears to contemplate the transfer of development rights from the Atlantic Center to Site 5 and further development of the Atlantic Center. While the project description for this project does include some development of Site 5, it does not include the planned expansion of Atlantic Center. The DEIS must accurately describe what is contemplated in the second MOU and include the development contemplated therein as part of the project or at the least the cumulative impacts of the further development of Atlantic Center with the current proposal. The Times has yet to write about this. In fact, the only daily paper to write about the second MOU was the New York Sun, in an 8/18/05 article headlined PRIVATE MEMO GUARANTEES RATNER SPACE. In the article, Ratner spokesman Joe DePlasco said that plans for Site 5 were disclosed at a 5/26/05 public hearing and in some local newspapers--true--but he said nothing about previous disclosure of plans for Atlantic Center. The Sun reported: As for the memorandum, a spokeswoman for the Economic Development Corporation, Janel Patterson, said that although it was never distributed publicly, it "has been available to anyone that requested it." Note: there was no particular reason for the Times to shoot a generic post-Christmas photo outside one of Ratner's Brooklyn malls. In fact, the Times did shoot a second picture at Macy's at Manhattan's Herald Square; that smaller photo accompanied the Contents box on the front page of the main section. I don't suspect there was any intention to burnish the image of Forest City Ratner. It was likely the most convenient shot logistically for the assigned photographer. But if Times staffers were reminded that the developer is partnering with the New York Times Company on the new Times Tower, they'd have a heightened awareness of Forest City Ratner properties--for example, that 5/22/05 story mentioned above that praised the Atlantic Terminal mall should have named the developer, but it didn't. And they might identify the malls correctly. Because it matters.